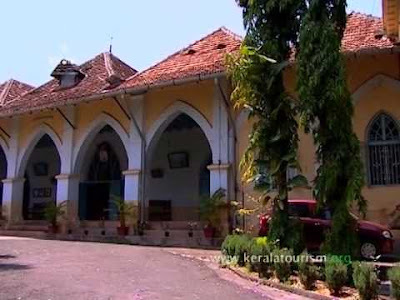 Built atop a small hill close to the Parade ground, Kochi this grand Portuguese building with a large driveway was built in 1506 for the resident Portuguese Governor. Now, It houses the Bishop of Kochi and adjacent to the Bishop's House is the Indo- Portuguese Museum and it an extension built over the remnants of the old Fort Kochi. The Indo-Portuguese Museum situated in Fort Kochi takes us back to the Portuguese colonial time and their impact in this region in terms of architecture art and culture. The artifacts, etc on display here give you a glimpse into the Portuguese Colonial history here. The credit goes to the late Dr. Joseph Kureethra, Bishop of Kochi, who put in sincere efforts to found this museum so that it will be beneficial to the posterity. His main intention was to protect and showcase the rich cultural heritage and Portuguese influence. 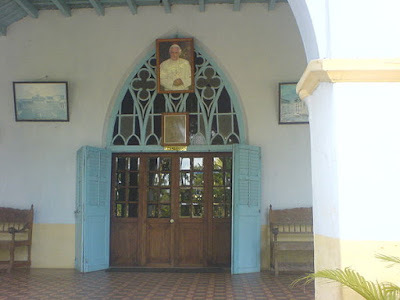 It is to be noted that it was the Portuguese Era that established the very first major European link with the Indian subcontinent that too on the coastal Malabar and later in Goa. The Indo-Portuguese Christian Art heritage has a long history and is well preserved here. 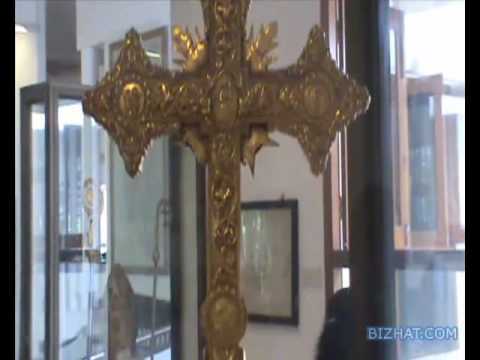 This heritage Museum has five sections all related to Christianity as adopted by the Portuguese Catholic Christians - Altar, Treasure, Procession, Civil Life and Cathedral. A piece of 16th century Altar made of teak wood from the Church of Our Lady of Hope, Vypeen, a chasuble (19th century) from Bishop's House, Fort Kochi, a 17th century processional Cross made of silver and wood from Santa Cruz Cathedral, Fort Kochi, Indo-Portuguese Monstrance (18-19th century), from the Church of Our Lady of Hope, Vypeen. found on the old doors of the mansions. They have symbols of all religions engraved on them! When you visit the museum. Visiting Hours: 10:00 to 17:00 hrs. Closed on Mondays and all Public Holidays. 01. During the Portuguese period, Ft. Kochi was called Ft. Emmanuel Except some remnants, the fort is almost damaged because of many battles and raids. Gulbenkian, who bequeathed his assets to the country in the form of a foundation with its statutes approved by the Portuguese state on 18 July 1956. Their operation is worldwide. Contribution is by way of investments and donations. (vide: https://en. styled houses in India. 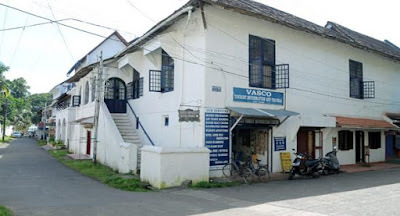 Vasco House, as it is called, is a major tourist attraction in Kochi and is very close to St Francis Church. Built in the early 16th century, it has European styled glass windows, balcony and veranda, besides high ceiling quite typical of that time. It is made of laterite and granite stones using lime-sand mix for plastering work. It was built in such a way as to reduce radiation inside during the hot summer period. For more details visit our sites:- Taxi Services in Kochi .